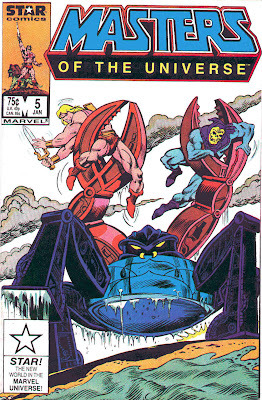 Masters of the Universe #5, “Monstroid,” is by the regular creative team: Mike Carlin, Ron Wilson, and Dennis Janke. Here, Hordak summons a giant robotic crab monster to destroy He-Man. Monstroid never got his own mini-comic, so that’s why we get him here, I guess. The three-faction conflict keeps things moving at a nice pace, although things get a little random and out of hand at the end. Carlin shows an interest in developing these characters, but he seems to have little regard for them as they’ve been established and developed in the past, and so he frequently takes them in strange and frustrating directions. He changes Extendar’s origin from a voluntary subject to a kidnapping victim. Orko is an irresponsible five-year-old again – he’s not feeding the fish? Seriously? This is like the cartoon at its most juvenile. The entire Horde is doing telepathy here, and Grizzlor seems to be inventing advanced cybernetic equipment. And Skeletor claims to be willing to die if it means taking He-Man with him. There’s not a great deal to be said about the art that hasn’t been said in reviews of past issues. No major complaints. This one’s not great, but at least we seem to be on the right track.